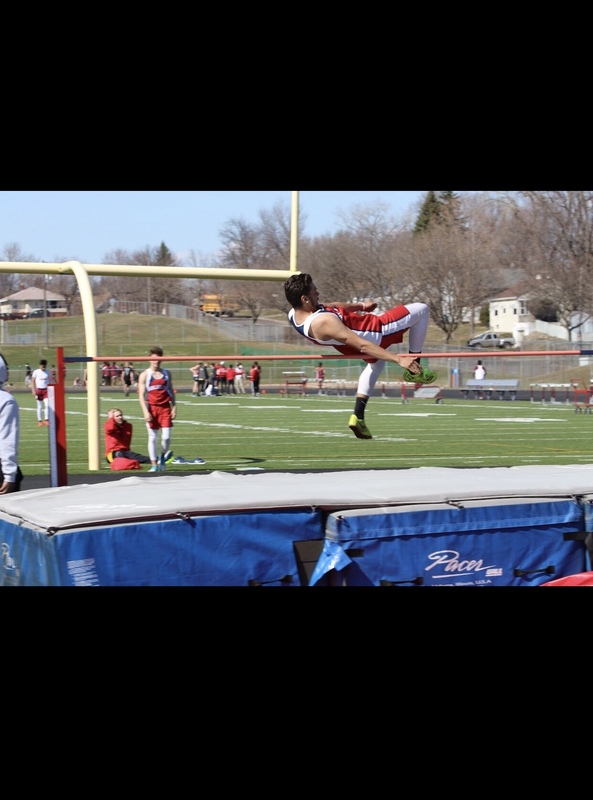 It was the section 3AA @ St. Croix meet, and the schools that attended were: St. Paul Johnson, Simley, St. Thomas Academy, South St. Paul, Hill-Murray, St. Paul Washington, Minneapolis Roosevelt, St. Paul Como, St. Croix Lutheran, and St. Paul Highland. It was a limited meet. There were only 2 people per event. The top 2 fastest runners, jumpers, throwers from each team were the ones who participated. The team with the most points, at the end of the meet, was going to state. The Highland boy’s team almost came over on top. 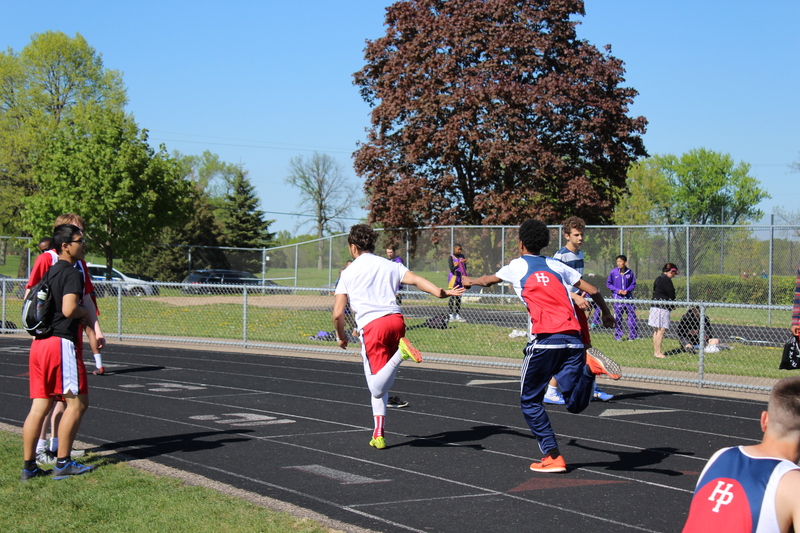 It was down to the last 3 events, and the Highland boys were in the lead, the St. Croix boys were in 2nd place, and the St. Thomas boys were in 3rd place. 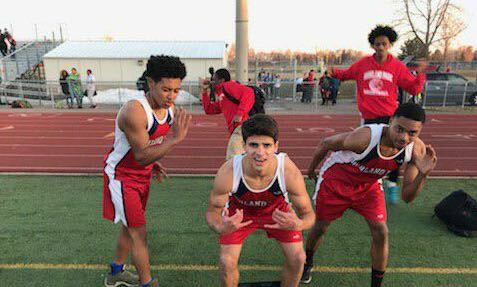 In the last 3 events, Highland came in 3rd or 4th place, and St. Croix Lutheran took the lead by 24 points, and during the last event, St. Thomas also got in front of Highland, so that put the boys in 3rd place overall. The schools that attended this meet were: Highland, Harding, Central, Johnson, Washington, Cretin-Derham Hall, Humboldt, and Como. The Highland Park boy’s team was in first place. The Highland park boy’s 4x100m dash first leg fell, and dropped the baton, handing it off to the 2nd leg. Highland was in last place, but ended the race in 3rd place. The boys 4×100 relay team said that they were going to make it up in the 4x200m dash. The 4×200 teams were with Central, Como, Harding, Johnson, Humboldt, Cretin, and Washington. The Highland boys made a comeback in the 4x200m relay by coming in first place over every team. The Highland Park track team has had 2 outdoor meets so far, and have done a good job in both. Highland’s first outdoor track meet was at Roseville High School. It was a good track meet; everybody did their best. Sprinters, long distance, jumpers, and throwers did as much as they could. Everyone was showing good sportsmanship, shaking the runners hands after a race, or the jumpers hand after a good jump. Since that was the first track meet, everyone was kind of rusty. Highland placed 5th out of 8 schools overall. Highland’s recent meet was at Harding High School; Highland competed against Harding and Como. Highland’s boys and girl came out on top with the boys earning 85 points, and the girls earning 96 points. Harding came in 2nd place, and Como Park took 3rd. Each Highland team had the fastest results in each event including the: sprinters, distance, hurdles, relays, long jump, triple jump, high jump, shot put, and discus throw. There was supposed to be a relay track meet, last Thursday, April 12, but it was canceled due to the remaining snow on the Central track field. The head coach of the track & field team decided that since the meet was canceled, we should prepare ourselves for the outdoor season. It was going to be Highland’s first track meet outdoors, but it also was canceled. Highland hosted a relay meet just for the Highland track team. The events included all the relays except the 4 x 100 or the 4 x 200 relay teams, because of a few lanes that still had a bunch of snow on them. So, we only had 3 lanes cleared that could be used, but the 4 x 400, 4 x 800, 4 x 1600, long jump, triple jump, and discus throw still happened. It was a very good practice meet. We were able to get outside for the first time this season, and run or do our field events. As a team, we looked pretty good. There are some events we do need to improve in though. Long jump is one of those events. Many people did long jump, but honestly, not many put up good numbers. In order to go to state in long jump for boys, you need to jump 20 feet or longer to make it to sections/state. Many boys jumped about 14-18 feet, which isn’t bad, but it also isn’t good enough. You get points in long jump the farther you jump, so in order for us to win Conference again (5 years in a row) we need to improve on our long jump event. Overall, the Highland track team is improving as a whole. Sprinters are getting faster, distance runners are getting better, and the jumpers are getting better too. This track season is going to be worth coming to watch. Everybody is going their hardest. The Highland Scots made a good run to make it to the 2nd round of the playoffs. In the first round, the Scots played Harding again, and came over on top at their home court. photo courtesy of Maddie T.
After Highland defeated Harding, we celebrated our victory and were able to advance to the 2nd round. The 2nd round was tough, and we had a very competitive game against St. Croix, who played very hard. They moved the ball well and got a lot of fastbreak points off of turnovers. Highland and St. Croix battled to the end, playing like it was the last game, which it was; it was win or go home. St. Croix wanted it more than us though, and they played team ball more than us. The Highland Park Scots pregame talk was nice, we talked about how we can defeat them and how to out work them. It applied to us in the first half, as it was a back-and-forth game, but the second half was an upset as the Scots let St. Croix wheel their way past us. It was play hard, or go home, and we didn’t play as hard, so that was the last of the Highland Park Scots boy’s basketball season. It was fun while it lasted, but also depressing at the end. – A bunch of T.O. Since this year’s team was a pretty veteran team, with a lot of seniors, next year’s team will be a fairly young one, but one with some experience. On February 21st, the Highland Park Scots took on Johnson High School in was a very competitive game. Both teams went back and fourth in scoring, but Johnson managed to go up by 15 points in the first half. In the 2nd half, Johnson didn’t execute like they did in the first. The Scots went on a 12-4 run and managed to catch back up, and tie the game, with less than 10 minutes left on the clock. We had multiple chances to take the lead, but just couldn’t execute. Johnson played very hard until the end, and the final score was 77-68. They played better offense than us, which gave them the extra boost to beat our Highland Scots. On February 23rd, the Highland Park Scots took on Como. Last time we played Como we came out on top with a victory, and score, of 74-69. Highland played well that game. The lack of communication on the defensive side cost us the game this time, and the turnovers on the offensive side also cost us the game. Como played hard, and hustled to everything, but they also played at a steady pace. When Como took the lead they did what they had to do to stay out in front. The Highland Scots played O.K., but it wasn’t enough to beat Como again. We played lazy and selfish instead of playing as a team. The Highland Park Scots are currently on a 4 game losing streak due to: selfish plays, poor ball movement, poor talking on defense, and nobody stepping up to be a leader on the floor. We have 2 more game left: Minneapolis Southwest for our last season game, and our first sections game March 6th. 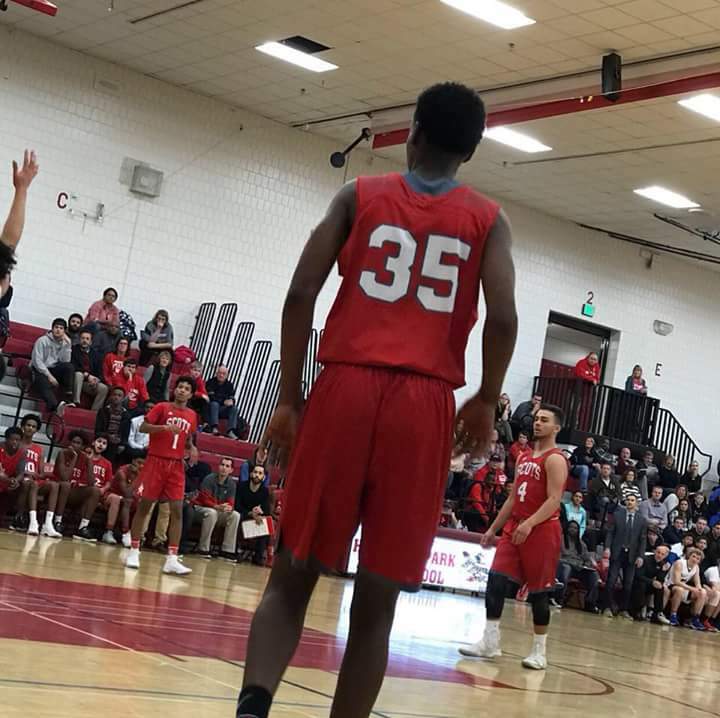 If we can go out and do what we have to do, like limit our turnovers, slow down, and play smart, we can win our last season game, and our first round sections game. *The Highland Park Scots boys basketball team recap of the last 3 games this past week. These 3 games left the Highland Park Scots on a 2-1 streak. A win against Como Park, a loss against Fridley High School, and a win against Washington Tech High school. On Tuesday, Jan 31, the Highland Park Scots had a conference game against Como Senior High School. It was a home game that consisted of a lot of teamwork and hard play. The starting line-up for Highland was: Benny H., Ian G., Mohamed B., Naseem L., and Abdalla M. During the tip off, Como received the ball and it all started from there. The Highland Park Scots team came put on top with a home victory against Como; the score was 74-69. It was a tough competitive game for both teams, and both teams played great. 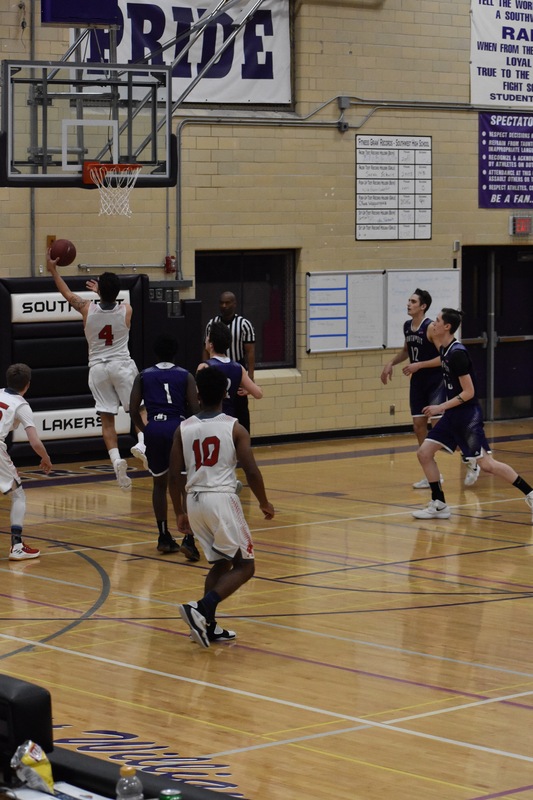 Friday, February 2nd, the Highland Park Scots played a non conference game against Fridley High School. It was a tough game for the Scots, as Fridley beat your Highland Park Scots with a score of 81-66. The Scots played well, but it wasn’t enough to beat Fridley. They came out hard, and ready to play, as they played smart and at a steady pace. On February 5th, we played Washington, and it was a good game; both teams played very well. Your Highland Park Scots came over on top with a score of 73-64. Highland was in foul trouble but managed to keep the good team work up, and score on our possession. Everyone on the bench was engaged in the game and cheering on the Scots. On February 8th, we took on our down the street rival for many years, and more years to come: Central! It was going to be a tense battle. Stands would be packed with fans & family. Last time we played the Minutemen, it was a tough one. We lost bad. 99-69. They came out aggressive and wanted it. For our game on the 8th, we were missing our best offensive scorer Evan B. He was out with an injury. So, other players were going to have to step up and wear that SCOTS on their chest with pride and play with heart for one another. It was a very tough and competitive game but Central came out on top in the end. 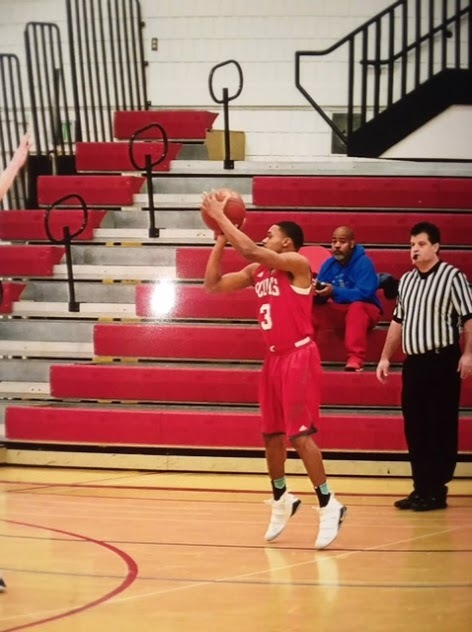 – We matched up well with Fridley, had size and speed on them, the Tigers just wanted it more.